'Gutai: 1953-1959' surveys the bold and experimental work of renowned Japanese avant-garde collective Gutai (1954–72). Our Chelsea gallery has been especially extended for this exhibition to 15,000 sq. ft to accommodate over seventy large-scale works by eleven artists. 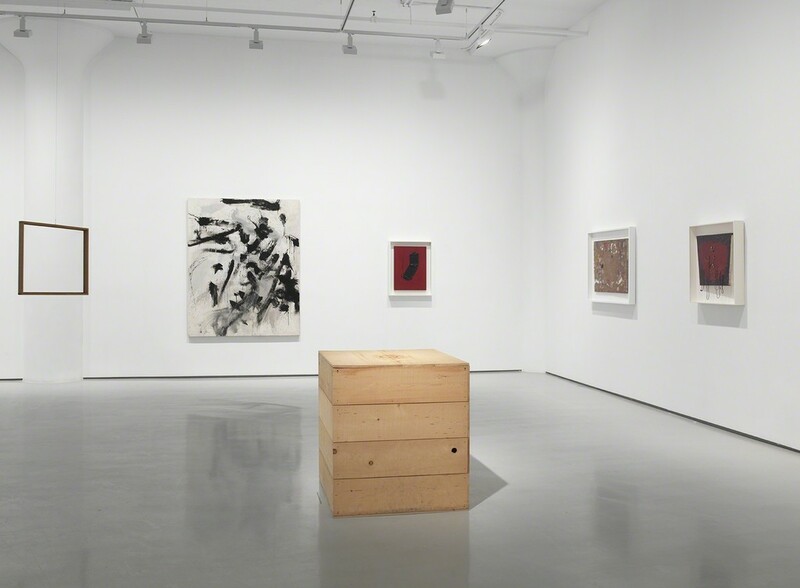 Fergus McCaffrey is pleased to present an exhibition surveying the bold and experimental work of renowned Japanese avant-garde collective Gutai (1954–72). 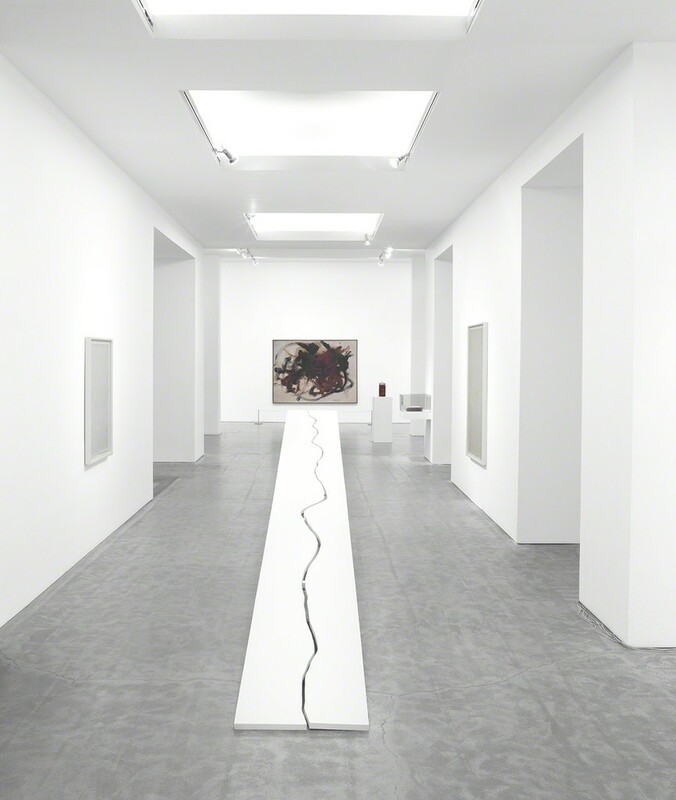 Since 2005, the gallery has been at the forefront of promoting understanding of Gutai in the United States and Europe, and our Chelsea gallery has been especially extended for this exhibition to 15,000 sq. ft to accommodate over seventy large-scale works by eleven artists—many of which are being exhibited in the United States for the first time. Museum quality in both scale and caliber of works on view, and featuring loans from the Museum of Modern Art, New York; the Art Institute of Chicago; and the Dallas Museum of Art, this will be the first exhibition to focus exclusively on the founding generation of Gutai artists during the pivotal period between 1953–59, during which they forged an ethos of artistic experimentation, freedom, and individuality in the wake of the Second World War. The members of Gutai were just young enough to avoid deployment in the Japanese military, but were mature enough to fully understand the horrors of what had occurred. Like all members of their generation, they endured hardship and trauma, and as artists they sought to reintegrate themselves into the world and express themselves by embracing what Gutai founder Jiro Yoshihara called “the scream of matter itself.” Using their bodies in active, direct relationship with their artmaking materials, artists like Kazuo Shiraga, Saburo Murakami, Atsuko Tanaka, and Toshio Yoshida dissolved the barriers between art and life. They considered their processes of creation to be as essential as the resulting works, and their goal was to merge their bodies with the material world in unmediated, experiential encounters—as Yoshihara put it, not to change material, but to bring it to life. To break free from the conservatism and militarism of the past, Yoshihara urged his understudies to “do what has never been done before.” With this emphasis on originality, the artists responded with a wide variety of paintings, sculpture, performances, and time-based interactive works that emphasized physicality and play, putting forth an aesthetic and political message of freedom. Fergus McCaffrey’s exhibition traces Gutai’s development and features works created before the formal establishment of the group in 1954 in Ashiya, Japan, through the Outdoor Exhibition of 1955, onto the theatrical stage in 1957, and concludes with its emergence and acceptance onto the international stage in 1959. Of particular focus are two moments: the impact of Akira Kanayama, Atsuko Tanaka, Saburo Murakami, and Kazuo Shiraga, who joined Gutai from Zero-Kai one year after the group’s founding in 1955; and the influence of French art critic Michel Tapié on the group beginning in 1957. 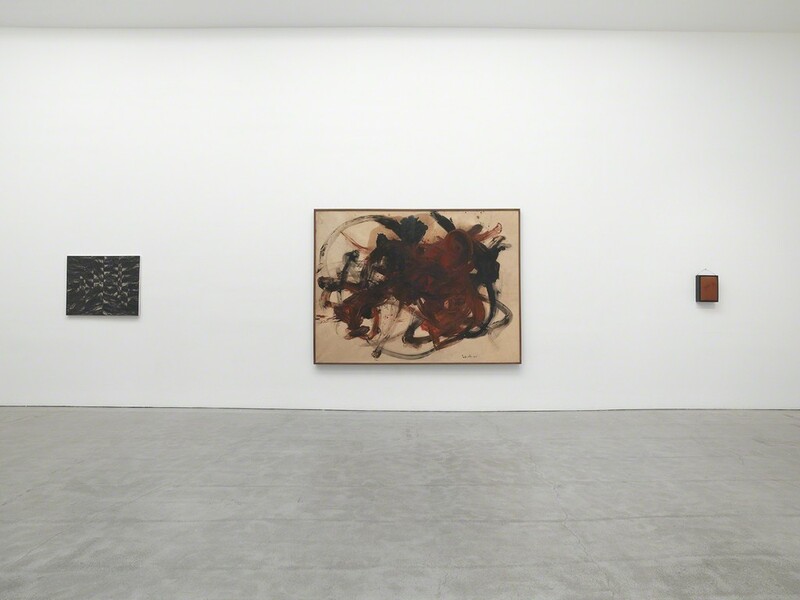 Tapié encountered Gutai through the group’s self-published journal in 1956, and first visited Japan in 1957. Often incorrectly maligned as the critic and art dealer who commercialized Gutai, Tapié’s influence was profound in the preservation of Gutai’s legacy as he proposed that the artists use more stable materials and generated a market for their works, enabling Gutai to sustain itself over three decades. The exhibition coincides with the release of three new documentary films produced by Documentary Japan for Fergus McCaffrey. Exploring the lives and work of Sadamasa Motonaga, Kazuo Shiraga, and Toshio Yoshida, the videos feature interviews with the artists’ families, friends, and curators, and provide insights into the personalities and creative impulses of these avant-garde pioneers. Highlights from the exhibition are detailed below. What is notable are the number of innovations in materials, practices, and concepts that anticipate or coincided with avant-garde developments in art in the United States and Europe during the same period. 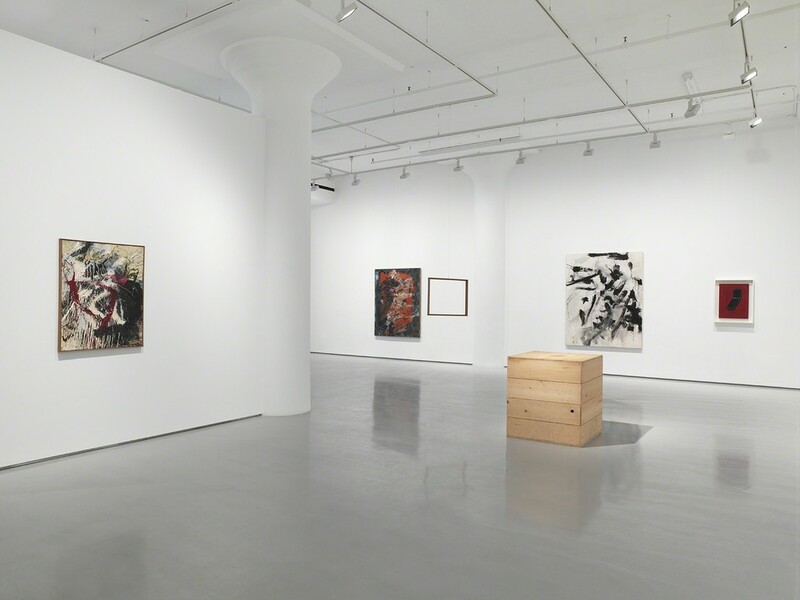 These works are testimony to Gutai’s achievements on the world stage. The genesis of Kazuo Shiraga’s remarkable aesthetic innovations are laid out in his sketchbook Note of Plan, which he kept from 1956–80; and the exhibition includes rare works such as Press Hard with Your Finger (1956), an interactive sculpture in which the viewer is encouraged to pierce the wounded flesh of the artwork’s surface; and Red Bottled Object, 1956 (2017), in which cows’ liver and intestines are suspended in red oil. All three works points to the artist’s interest in the abject, corporeal body, and point to the physical suffering and psychological trauma of wartime Japan. Shiraga’s first began painting using his feet in 1954 and his performance painting Challenging Mud, 1955 occurred three years before the first of Yves Klein’s Anthropométries of 1958. This is the first occasion on which these five works have been seen in the United States. Shiraga’s brief career as a solo artist spanned 1954 to 1961 and yielded works of nuanced simplicity and blunt materiality. During the 1950s, her primary materials were raw Japanese washi and torinoko papers, which she wetted and layered sheet upon sheet with glue. Her actions span minimal intervention such as delicate vertical or diagonal tears executed to reveal the paper layer beneath the surface, to bolder expressionistic works where she scratched and tore into the wet paper layers leaving imprints of the fingers and long dynamically gestural strokes. Also on view will be Shiraga’s White Board (1955), which the artist created for the group’s Experimental Outdoor Exhibition of Modern Art to Challenge the Midsummer Sun by taking a ten-meter-long plank of wood, painting it white, partitioning it in half with a long, winding cut, and installing it on the ground in a tilted stance. 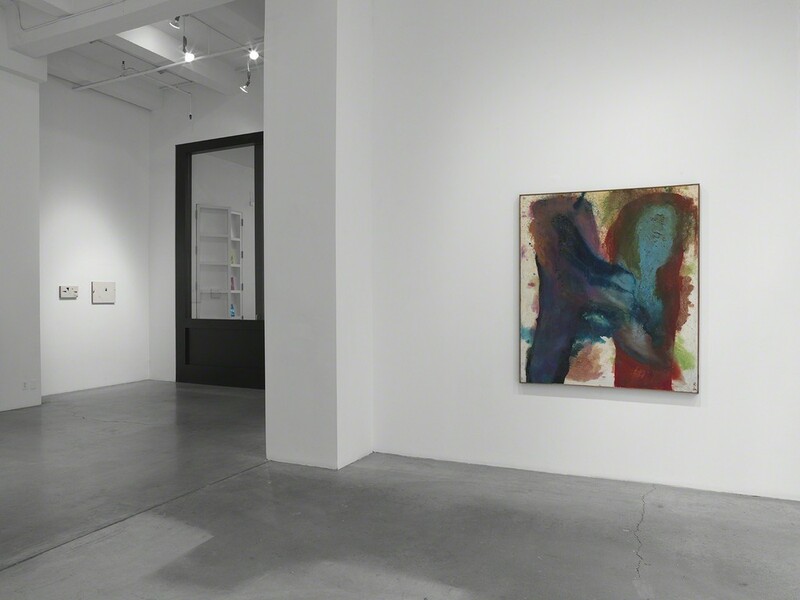 After 1961, Shiraga and her husband Kazuo Shiraga collaborated in the making of his foot paintings. Visitors to the exhibition will pass through Saburo Murakami’s Entrance, 1955 (2018), which is set in a wall directly behind the front door of the gallery. Originally performed by Jiro Yoshihara at the opening of the First Gutai Art Exhibition in Tokyo; the work is made as the performer flings themselves through the taut paper screen thereby creating an action-based performance-painting. 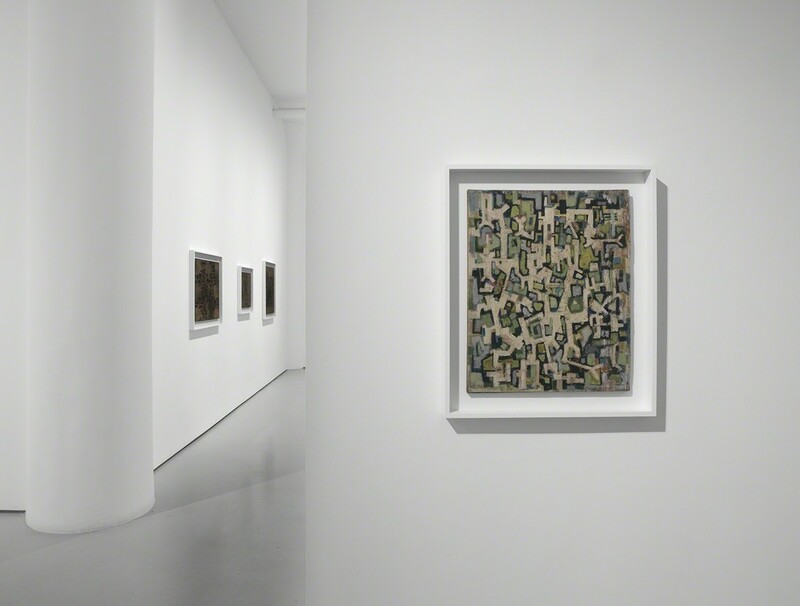 Distinct from the physicality of his paper breaking works, Murakami’s conceptual concerns are evident in Frame (1956), an empty painting stretcher suspended from above which stages the viewer as part of the work, making clear the contingency of position and perspective. Murakami embraced painting as a member of Zero Society, on view in his early painting Sakuhin, 1953 and Tapié encouraged further engagement and experimentation after 1957, yielding a hybrid auto-destructive painting Sakuhin, 1958 and Sakuhin, 1959 an explosive performance work from the collection of the Museum of Modern Art, New York. Motonaga’s ephemeral performance-sculpture Smoke, 1957 will be activated by the artist’s family during the exhibition, filling the gallery space with hovering rings of smoke lit-up with colored spotlights and accompanied by a live score. A bright red Mizu water sculpture from 1955 (2018) will also be displayed; a larger hammock style version of which occupied the rotunda of the Solomon R. Guggenheim in 2013. Motonaga joined Gutai independently in 1955. His first mature paintings date from 1954, in which he employed a vocabulary of embryonic shapes, flying objects, and cartoon-like forms modeled in heavy oil paint, as in Flying, 1954. Works from this period reveal his interest in children’s art, manga, and popular culture, establishing a life-long philosophy collapsing distinctions between high and low art. By 1957, Motonaga’s work had become more abstract (a direction confirmed by his encounters with Tapié) with flowing lines and pools of brightly colored pigment poured and dripped onto the canvas. 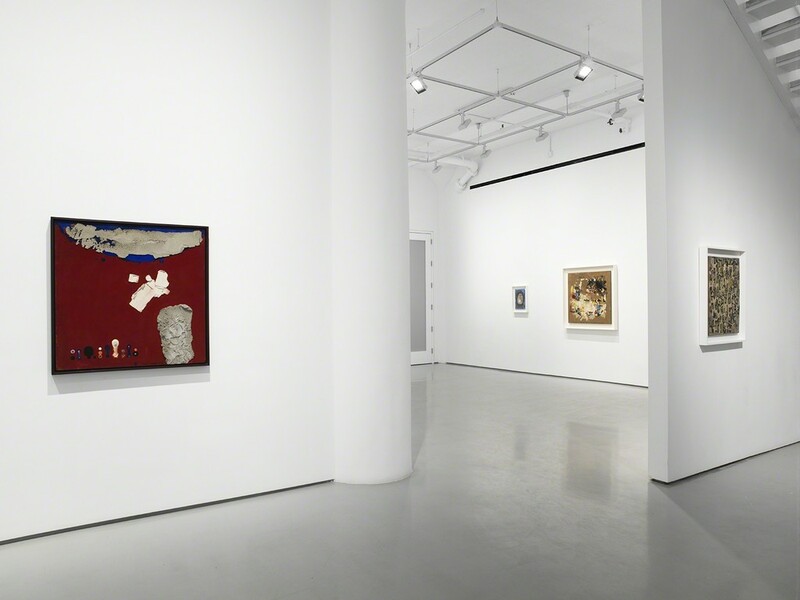 Sakuhin, 1958 is a prime example taken from the Rachofsky Collection, Dallas and is thought to have been first exhibited in the United States at Martha Jackson Gallery’s Gutai exhibition in New York in 1958. Tanaka famously contributed her Electric Dress to the Second Gutai Art Exhibition in Tokyo in 1956. She and her partner Akira Kanayama stood apart from the raw physicality of many other Gutai members, employing a more mathematical and scientific approach to art making, as witnessed by her 1955/1993 interactive sculpture Bells. Tanaka wired 12 electric bells together that were sequenced with different time patterns to ring aloud and jarringly throughout an exhibition space. Tanaka later explored the resemblance of her electrical circuitry to the human body’s neural networks in paintings and works on paper. Yoshida was a member of Gutai from its inception in 1954. In performance, Yoshida contributed the work Shadows to Gutai Art on the Stage in 1957, and his marriage to Kyoko Morita was incorporated in a Ceremony by Cloth at the Second Gutai Theatre Art in 1958. However, his enduring impact is as a painter of tremendous innovation and extraordinary touch. Of early note is Untitled (Y94, 53-4), 1953, a paper and wood panel on which Yoshida added vigorous layers of red on black paint, which the artist then punctured in multiple places in order to add hanging loops of string that drop down below the bottom margin of the panel. 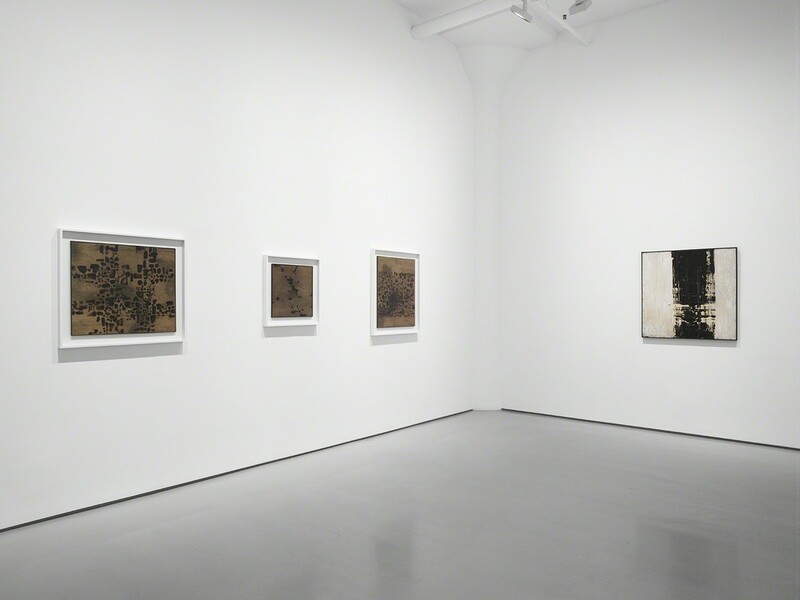 A year later, he began a series of Burn paintings on plywood panels made with a soldering iron and burner, which culminated in the extraordinary Untitled (56-2) from 1956. Here, Yoshida applied a thick layer of raw papier-mâché with isolated passages of bright raw pigment to a panel before taking a blow torch to the back of the painting and burning a large hole through the center of the painting. 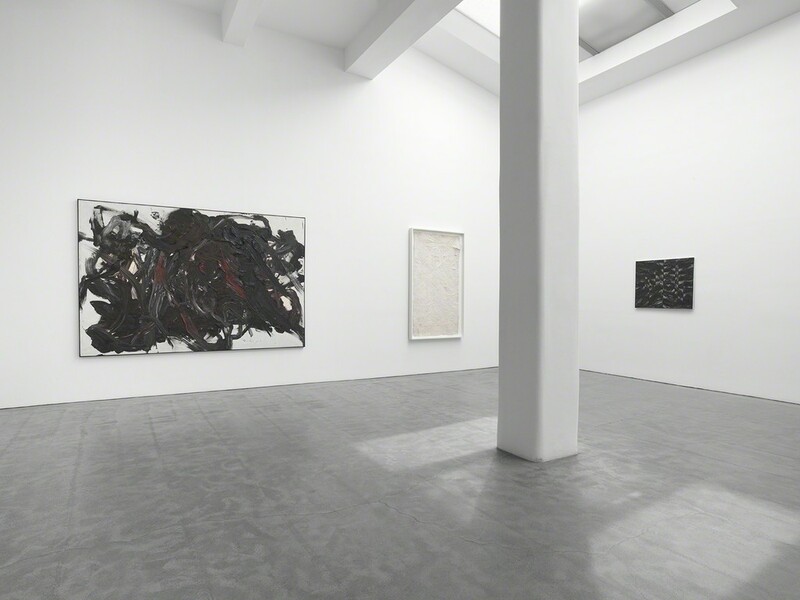 It is worth noting that Yoshida’s explorations of the expressive potential of fire in painting predate Alberto Burri’s Combustione paintings (1955) and Yves Klein’s Fire paintings of 1957. Another audacious innovation in 1956 were Yoshida’s largescale stroke paintings such as Sakuhin (56-10), which feature dynamic, heavily impastoed strokes of single color on contrasting monochrome panels. The authority and singularity of the artist’s gestures mark these as standout works both in Gutai and the greater history of art of the period. Founded in 2006, Fergus McCaffrey is internationally recognized for its groundbreaking role in promoting the work of postwar Japanese artists such as Sadamasa Motonaga, Natsuyuki Nakanishi, Kazuo Shiraga, and Jiro Takamatsu. 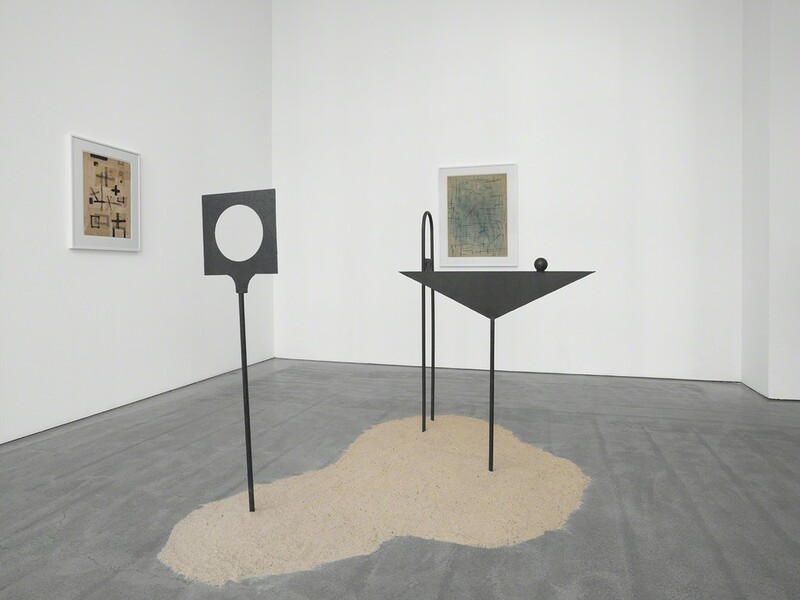 The gallery also exhibits the work of emerging and seminal Western artists such as Marcia Hafif, Birgit Jürgenssen, Richard Nonas, Sigmar Polke, and Carol Rama. In keeping with the gallery’s commitment to Japanese art and culture, we are pleased to announce that Fergus McCaffrey has recently open its Tokyo outpost this past March with an exhibition of paintings by Robert Ryman.